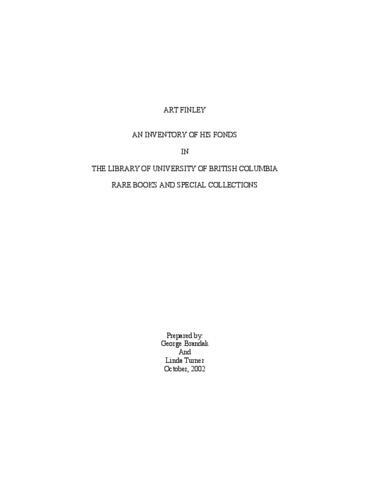 Born in Fairmont, West Virginia, in 1926, Art Finley was active in the radio television broadcasting industry for fifty years, 1944-1994, prior to retirement in Victoria, BC. Beginning with KXYZ Houston in 1944, Finley established radio stations for the US military in Newfoundland, 1951-1953, went to New York, 1953-1955, and accepted a position as a TV producer and director for children's shows in San Francisco and Stockton, California, in 1958. After being employed by several TV and radio stations in San Francisco, including talk show programs at KSFO, he received a contract from CHQM, Vancouver in May, 1968. Shortly afterwards, he bagan doing talk radio with CKNW until 1974 when he returned to San Francisco to do talk programming with KGO. After that contract ended, he returned to Vancouver to work with CJOR, 1981-1986. Finley completed his radio talk show host career by working in Norfolk, Virginia, 1987-1988, San Diego, 1989-1990, and San Francisco, 1990-1994. The fonds consists of audio cassettes of interviews (100) with a variety of personalities (79) from the fields of entertainment, politics, and the professions relating to their careers and issues of the day recorded on radio talk show programmes at KSFO San Francisco (1), CKNW Vancouver (57), KGO San Francisco (10), CJOR Vancouver (23), WNIS Norfolk (3), XRA San Diego (5), and KCBS San Francisco (1) from 1960 to 1990. Some of the tapes include questions from listeners to the talk show guests. The people interviewed by Art Finley included some of the prominent personalities and newsmakers of the 1970s and early 1980s: Mohammed Ali, Joan Baez, Bill Graham, Germaine Greer, Henry Heimlich, Yousuf Karsh, John Lennon, Henry Morgentaler, Huey Newton, Pierre Trudeau, and Gore Vidal.